Gold is a dense, soft, shiny, malleable and ductile metal. Gold has been a valuable and highly sought-after precious metal for coinage, jewelry, and other arts since long before the beginning of recorded history. Gold standards have been the most common basis for monetary policies throughout human history. Gold has also been frequently linked to a wide variety of symbolism and ideologies. In India gold is considered as an important metal. India is also one of the biggest consumer of gold in the world and most of which is used for jewelry. 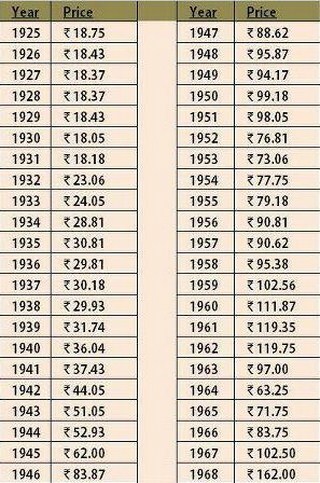 But the price of gold is increasing at a rapid rate. 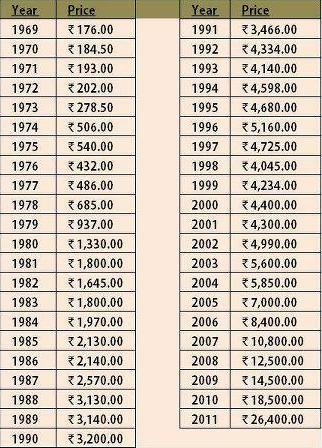 Here is a price list of 10gram of gold price history for the last 86 years ( From 1925 To 2011 ).